Interesting & progressive days lie ahead in Nigeria’s business space. But I must say, brace up because the days ahead will be tough, very tough and quite tougher than the last few years. You may be wondering what the hell he is saying. Simple! I was at the Deloitte Nigeria Economic Outlook event held last Thursday where two ministers (Budget & the Finance Minister) were present. Thanks Deloitte! One positive takeaway was how much work Nigeria is doing in the ease of doing business. While we are yet to get there, a lot of progress has been made; targets top 100 in Global Ease of Doing Business Index. But I was so worried listening to the two ministers, especially as it relates to the Budget and how to close the Funding. Gap. Put mildly, “the government is unable to figure out any other way to fund the budget, so be ready to come to their aid”. In other words, expect more taxes!!! 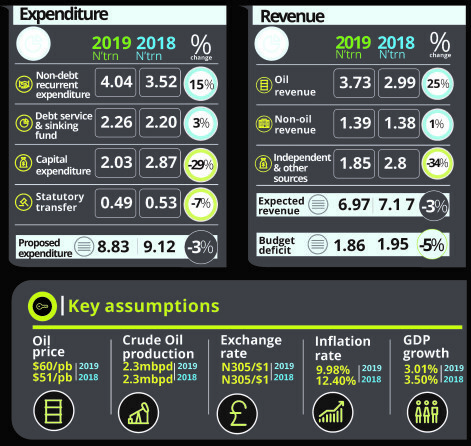 2018 Budgeted Revenue from sale of Crude Oil N2.999 trillion (Actual crude revenue – N2.08 trillion – 69% of budget). Ok, these are 2018 numbers. In 2019, proposed budget will be slightly lower than 2018 budget by N294 billion. Thus, proposed 2019 Expenditure is N8.827 trillion. Proposed fiscal deficit – N2.45 trillion Did you notice that we borrowed to fund recurrent spend in 2018? And that we had abysmal performance on capex at 43% (in fact, as at 14 Dec 2018, only N820.57 billion was released for capex, in other words, about3 410 billion was released between 14 & 31 Dec 2018 for capex spend.)? So we are at it again, I can’t foresee the time the government will start investing in critical infrastructure (thanks to the Executive Order No. 007). Even the EO No 007 poses its own challenge. Despite missing Corporate Tax Revenue budget by N134 billion, and the commencement of this new Executive Order, the Government still budgets N150 billion more than actual collections in 2018. Can you guess where this excess will come from? You and I will pay, simple. Despite hitting only 69% of crude oil revenue, the proposed 2019 budget projects N3.69 trillion from sale of crude oil; N690 billion more than the 2018 budget and N1.6 trillion more than actual revenue from crude in 2018. .. another threat… while we hope to produce 2.3 million bpd of crude, OPEC pegged Nigeria’s production at 1.69 million bpd (i.e., without going to town, the core driver of our budget revenue, the production quantity was cut by 36% by our OPEC masters. But the minister says we may have to re-discuss this with OPEC or shore up with concentrates (hope I got this term). In brief, please prepare for more taxes, the quickest fix is to raise VAT. The Honourable Minister of Finance mentioned the carbonated drinks as one area to generate more revenue… So Sugar taxes will come on-board. Taxes on Tobacco and the likes is a given. More taxes will come on the very rich; so if you have private jets & yachts, get ready. Are you a musician? More will come knocking from all angles. Sportsman? Sure, you are not forgotten. I envisage an update on PITAM in few years from now, not sure it will go beyond three years away. But my biggest concern is that even if VAT revenue increases by 200%, we will be way short of our needs. Even if we raise Corporate tax income by 100% (including a 200% increase in VAT income, we will still be far away). You recall that Customs suggested a reduction of duty on imported cars from 70% to about 45%? Maybe that’s why the 2018 customs budgeted revenue is higher than 2019 by about N22 billion. Expect the hammer to fall after the elections, true, we can’t run away. I advise that you start stress-testing your numbers against increase of VAT to 10% and see what impact that will have on your price. This will be happening despite our weak buying power due to loss of currency value. In the midst of all these is the monetary policy issues. Prof Doyin Salami in his presentation said he can’t bet that Naira will get any stronger. In another fora, some experts say that Dollar will head towards N398 while some entities are planning with N440 to a Dollar. Even of bigger concern to me at the event was the signal sent to the global community that the days ahead will be tough. But that’s the truth. So, I implore you to start planning for the rocky days ahead. Hopefully, we will walk through this furnace without much damage. Simon Obasi is a chartered accountant and the West Africa Finance Controller of Greenlight Planet, makers of the Sun King brand of Solar Home Systems. Nice write up bro, I feel this too and I have been asking myself several questions, one of them includes, ‘why am i a Nigerian self’, why is it that we do not see some of these things on time and solve them as they arise?, why is it that we have always had the problem of leadership? Why can’t ideas to make this economy thrive be listened to and adopted by those who lead us? However, I hope for a change to come soon as at this pace, i wonder what we would tell our children went wrong with us as a Nation. Augustine, these questions and regrets of being a Nigerian won’t even help matters at all. In fact, it’s actually heating us up. It’s like being in a long distance race and suddenly stopping dhort to ask questions and regret participating in the race. Now to contribute to the post by Simon Obasi. I must say the last paragraph of the post was my favourite part. Also there was a paragraph you mentioned about suggesting the FG. To the best of my knowledge, they have received tons of ideas and suggestions, but they are reluctant to implement those. Permit me to divert to politics. What we need most direly is a good leader. When I mean good, I mean balanced; A business-oriented person inclusive. I think it’s a safe decision to stop at this point.